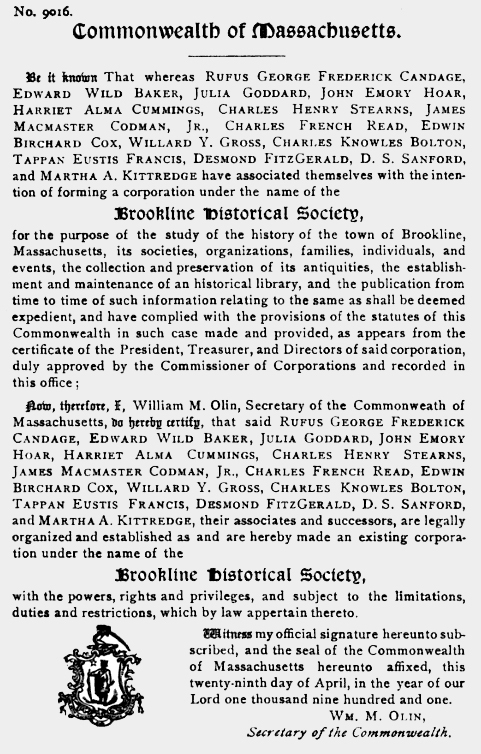 The seventh annual meeting of the Brookline Historical Society was held in the G. A. R. Room, Town Hall, Brookline, Mass., on Wednesday, January 22, 1908, at 8 P. M., in accordance with a notice mailed to every member. In the absence of Captain Candage, the president, Charles H. Stearns, Esq., the vice-president, was in the chair. The President's Annual Address was read by Mr. Charles F. Read. January 23, The President's Annual Address. February 27, The Woodward House, Clyde St.; a study of its construction, with drawings and some account of its occupants from 1715 to 1900, by Miss Ellen Chase and Charles F. White. Read by Charles F. White. March 27, "Early Predecessors of the Heath School," by Michael Driscoll. April 24, "Rebecca Nourse," by Miss Louise Howe. Read by Miss H. Alma Cummings. May 22, "The Settlement of Massachusetts Bay Colony under Roger Conant, 1623-1628," by Mrs. Sarah S. Bartlett. October 30, "The American Revolution: Its Causes and Commencement: The Royalist's View," by James H. Stark. November 27, "Charles James Fox: The Colonies' Friend in Parliament," by George S. Mann. December 18, "The French Neutrals," by Miss Louise Flagg. 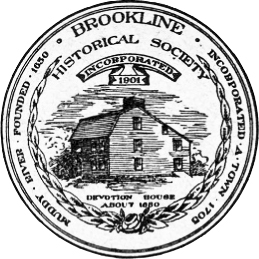 of the Society has increased materially during the past year, largely by means of a circular letter addressed to citizens of Brookline by the Committee on Membership. There are at present 177 members in the Society, of which four are benefactors and twenty-three are life members. This result proves that the people of our town are disposed to assist the Society in its work of studying the history of Brookline and preserving its antiquities. Record Commissioner of Massachusetts, who died at his home, Beacon St., Brookline, July 26, 1907, aged 64 years. He was born in Dorchester, Mass., and there became clerk of the Municipal Court; later, in 1882-83, was elected to the General Court, and still later was appointed Record Commissioner, a position he held at the time of his death. He was well and favorably known to the community at large. died at her home on Columbia street, Brookline, Sept. 17, 1907, aged 67 years. She was the widow of our former member, Frederick Thayer Stevens, and joined the Society with him in 1903. They were much interested and regular attendants on the meetings of the Society until his death and her illness prevented. widow of Edward Atkinson, a native of Brookline, in which she had always resided, died at her home Dec. 12, 1907, aged 77 years. She and her late husband joined the Society shortly after its organization, and, although not able to attend its meetings, took a deep interest in its affairs. who had been actively interested in the welfare of the Society and had served acceptably on its committees, died at his home in Brookline, Dec. 24, 1907, aged 73 years. Capt. Folsom was born in Exeter, N. H., in 1834, and came to Boston early in life and became a newspaper reporter on the Atlas and the Bee, and later on the Journal. In 1854 he entered the service of the Boston and Providence R. R. Co., and became its general ticket agent. In 1860 he became the head of transportation, with his office at Providence, in 1864 he was made assistant superintendent and in 1867 superintendent of the road, in which position he remained until the road was merged in the New York, New Haven & Hartford R. R. Co. Capt. Folsom was a prominent member of the Ancient and Honorable Artillery Co.; he was a Mason of high respect, having served as Master of Columbian Lodge, was a Knight Templar, and had been Deputy Grand Master of the Massachusetts Grand Lodge. He was deeply interested in historical matters, and a member of various historical organizations. He possessed a retentive memory for historic dates, was a good conversationalist, an agreeable acquaintance, and a warm and devoted friend. in 1907 were 380, of whom 109 had reached, and in most cases, exceeded the bound of three score and ten, and 73 had exceeded 75 years; 30 were between 75 and 80; 26 were between 80 and 85; 10 were between 85 and 90, and 5 had exceeded the limit of 90 years. The 5 above 90 were Samuel Hall, 92; Joseph K. Hayes, 95; Nancy P. Gibbs, 90; Samuel G. Leavitt, 91, and Thomas E. Quimby, 90. Those between 85 and 90 were Charlotte E. Varney, 88; Mary Mitchell, 87; Mary A. M. Faxon, 89; Mary Lyons, 88; Edward Russell, 86; Elizabeth Postawka, 86; Anne Loring, 86; Elizabeth F, Porter, 86; Edwin 0. Marston, 87, and George Brooks, 87. Those between 80 and 85 were Annie E. Bowman, 82; Isaac L. Cox, 80; Rebecca W. Prescott, 80; Anaretta F. Leighton, 81; Elizabeth S. Wilbor, 80; Catherine E. Rametti, 80; Nancy C. Farwell, 83; Thomas H. Talbot, 83; Hannah S. Nettleton, 80; Mary A. Proctor, 84; Mary E. Hall, 83; Marcia A. Patten, 84; Fanny Cohen, 80; Nathaniel H. Furness, 81; Andrew J. Huey, 84; James G. Wiswell, 80; Susan Lucas, 84; Eneas Smythe, 81; Caroline Stern, 80; Rachel Bowes, 84; Angelina P. Tufts, 80; Elizabeth S. Folsom, 80; Sterne Morse, 83; Anne Boland, 80; Mary L. Talbot, 81, and Matilda C. Dexter, 83.
proved to be one of many historical celebrations in our state, and not only in the state but in our country, beginning with the Jamestown Exhibition in honor of the settlement of Virginia. In August there was a celebration at Falmouth, Mass., in memory of Bartholomew Gosnold's visit to the shores of that town in 1602. On August 15th there was unveiled at Gloucester, Mass., a bronze tablet in memory of the men who, at the instigation of Rev. John White, came from Dorchester, England, in 1623, and made Gloucester the first settlement in the Massachusetts Bay Colony. On August 20th occurred the great celebration, with an address by President Roosevelt, in connection with laying the corner stone of the Pilgrim Memorial Monument at Provincetown, Mass., in honor of the first harbor made in America by the Mayflower and the first landing of her passengers on American soil. Historical leaflets of great value relating to those several periods commemorated by these observances were published in the Old South Leaflets series. First is the account of Gosnold's settlement at Cuttyhunk, written by Gabriel Archer, who accompanied Gosnold on his expedition in 1602. The third centennial of that event was held in 1902, when the corner stone of a Gosnold Monument was laid at Cuttyhunk, which was completed and dedicated in 1903. The Falmouth people were behindhand in their celebration; Gosnold sailed from Falmouth, Eng., March 25, 1602, and sighted the coast of New England on May 14th, then skirted the shores of Cape Cod and came to Martha's Vineyard and the Elizabeth group of islands, to both of which he gave their names. His settlement at Cuttyhunk was the first in New England, and Archer's account of it is actually believed by some to have supplied Shakespeare with local color for his "Tempest." In Bradford's "History of Plymouth Plantation" we find the account of the voyage of the Mayflower, and the signing of the famous compact in Provincetown harbor at the end of the voyage. Bradford's historic manuscript is preserved and exhibited in the State Library and lies open at the place where the compact is worded. Near the time that the Pilgrims were signing the compact in the cabin of the Mayflower at Provincetown harbor, Rev. John White of Dorchester, England, was planning for a settlement farther north on the New England coast as a headquarters and refuge for fishermen resorting to these waters, out of which sprang the settlement at Cape Ann in 1623. "White's Plantation Plea," published in London a few years later, played an important part in the history of the settlement of Massachusetts. It is an interesting portion of this which is printed in the Old South Leaflets. The people of Dorchester, Mass., have placed a tablet to White's memory in the church at Dorchester, England. The celebration at Gloucester fittingly calls attention anew to Rev. John White, who has been called "the father of the Massachusetts Bay colony." Another New England celebration in 1907 worthy of mention here was the one held at Bath, Me., in honor of the building of the first vessel in New England by the Popham colony of Maine in 1607. The centennial observances of John G. Whittier's birth and others during the year past have served to make 1907 a year of historic anniversaries worthy of record. BROOKLINE ONCE A SHIPBUILDING TOWN. Many citizens of Brookline have been merchants, ship-owners, shipmasters and engaged in mercantile affairs in Boston, but it is not generally known that shipbuilding was once carried on within the limits of the town. Joshua Magoun, a shipwright from Pembroke, Mass., and Francis Turner, from Scituate, under the firm name of Magoun & Turner, established a yard for building vessels on the Charles River in Brookline in 1832, at or near the site of the Cousens Coal Wharf, on what is now Commonwealth avenue. In 1832 they there built and launched the barque "Brighton," of 337 tons, owned by Rice & Thaxter of Boston, and the schooner "Concert," of 68 tons. In 1833 they built the barque "Burlington," of 406 tons, for Rice & Thaxter of Boston, which vessel was struck by lightning and burned in the North Atlantic while on her way from New Orleans to Havre with a cargo of cotton, in March, 1840. In 1833 Magoun & Turner also built the ship "Marathon," of 382 tons, for William Eager of Boston. In 1834 they built the schooner "Silver Spring," of 67 tons, for Stephen Sawyer and others of Charlestown, the schooner "Abigail," of 89 tons, for John Manson of Scituate, and brig "Caribbean," of 173 tons, for Andrew Cunningham of Boston. The "Caribbean" was wrecked and a total loss at Carlescrona, in November, 1836, while bound to Boston with a cargo of wheat, rye, feathers, etc. In 1835 they built the schooner "Gustavus," of 93 tons, for Charles Cole and Nehemiah Manson of Boston, and the schooner "Blue Rock," of 69 tons, for Stephen Sawyer and others of Charlestown, and also the brig "Oak," of 177 tons, for Rice & Thaxter of Boston. The brig "Oak" was lost Nov., 1853, on Maccaros Shoal on the voyage to New Orleans from Rio de Janeiro. Joshua Magoun was elected a measurer of wood in Brookline in 1832, and again in 1835. About the year 1836 Messrs. Magoun & Turner removed their shipyard from Brookline to Charlestown Neck, where in the next twenty years they built some fifty vessels. Francis Turner was a representative to the General Court from Charlestown in 1842. He died in 1851, and his partner, Joshua Magoun, in 1856. Thus it is seen that at least ten vessels were built in Brookline between the years 1832 and 1835, inclusive, by Magoun & Turner. The late Benjamin F. Delano of Chelsea informed the writer some years ago that he as a young man came from Duxbury, his native place and worked as a carpenter for Magoun & Turner, upon the first vessels which they built in Brookline. Voted, To print the president's annual address, treasurer's report, by-laws, list of officers and members, and such papers as the Committee on Publications may select. From time to time, in newspaper and magazine articles, the town of Brookline is advertised at home and abroad as "the richest town in the country." What is more to its credit, since the population has increased to the proportions of a city, the town is constantly referred to as an example of municipal administration marked by honesty, intelligence and progressiveness. All classes of the community participate actively in public affairs, and the town benefits by the cooperation of all. It has been the very good fortune of the town that such cooperation has been influenced and guided by the well-educated and clear-headed citizens who have given freely of their time and contributed to the common good from their experience and knowledge of business, the professions, the arts and the sciences. Further, the citizens of moderate means, the well-to-do, and those of great wealth have willingly borne their share of the taxes which have been necessary for the benefit of all. Although the town has been the home or residence of many families of abundant fortune it has profited in comparatively few instances from the gifts or bequests of its native or adopted sons or daughters. During the more than two hundred years of the town's history, the writer learns of only three bequests for the public benefit of which there is any record or remembrance today. In 1762 the town received the Edward Devotion School Fund. A century later, in 1867, under the will of James Sullivan Warren, a fund was established for the purpose of planting trees along the town highways, and in 1876 the Public Library benefited by the bequest of Martin L. Hall for "the purchase of books of standard value." The generosity of John L. Gardner, whose interest prompted his gift to the Public Library, should not be overlooked, and full credit should be given to those individuals who have made gifts to particular schools or for certain specified purposes; but the present consideration applies only to bequests for a general public benefit. In the year 1634 the General Court ordered a "sufficient cart-bridge built over Muddy River," and at a later date (1640) the cost of this bridge was apportioned between the towns of Boston, Roxbury, Dorchester, Cambridge and Watertown. The town of Cambridge in 1635 made provision for a causeway and a broad ladder down to low water for the convenience of the ferry across Charles river to the road from Roxbury and Boston. Between the Muddy River cart-bridge and the ferry to Cambridge was the established line of travel from Boston to the colleges, but it was not until the year 1662 that the river was spanned by a bridge. In 1662, however, a bridge was built near or at the place where the bridge now crosses the river close by Soldiers' Field. At the time it was built even until the present, that bridge was and is legally designated as the "Great Bridge." The completion of the "Great Bridge" brought about the formal laying out of "the common highway betwixt Boston and Cambridge." There was considerable controversy over the matter, but, after the committee had "viewed several ways," and had "debated the matter with committees for the towns of Boston and Cambridge," who did not agree, the report was finally presented and accepted, that "the said way shall goe without the common field by Goodman Devotion's and Goodman Steven's houses and so to Cambridge bounds as the old way now runneth." So the highway from Boston to Cambridge was laid out, and was the only way to Cambridge, except by ferry, until 1793. This was the road traveled by the dignitaries of the church and officers of state traveling by horseback or coach between Boston and the colleges. Along this road were set the old milestones, under the direction of Paul Dudley, of which seven were necessary to mark off the road to Cambridge. One of those old milestones stands today in the lawn of Harvard Church, nearly opposite where it originally stood, when erected in 1729. Over this road, on April 19, 1775, marched Lord Percy with three regiments of infantry, two divisions of marines and two pieces of field artillery, on the way from Boston to reinforce the eight hundred grenadiers who, in the early morning, had crossed in boats from near the present Park Square, Boston, to Phips Farm in East Cambridge, and thence to Concord and Lexington. In the months following Lexington and Bunker Hill, this particular road was a throbbing artery of military life and energy. With the ten thousand British in Boston besieged by the sixteen or seventeen thousand American troops extending from Roxbury to Cambridge and Charlestown, the old road was marched over and back by the troops from Rhode Island, New Hampshire, Connecticut and all parts of Massachusetts. Towards Boston traveled those whose sympathies made it necessary to seek protection within the lines of His Majesty's forces; and in the other direction stretched the line of those fleeing from the sufferings and privations of the beleaguered town, to seek shelter and assistance from friends and fellow patriots in the country outside. Truly the road has its history, and an old house which has stood where it now stands facing that road for two hundred and twenty-eight years is entitled to some respect from the schoolboys and girls of today, as well as from their elders, even if the old house does not quite harmonize with its surroundings. Edward Devotion (1st) joined the First Church in Boston, and became a freeman in 1645. He was a planter, and lived at Muddy River. He was the father of eleven children, and his possessions in land were on both sides of the road from Boston to Cambridge, where the house, now standing, was built in 1680. Among his children were sons John (born 1659) and Edward (born 1668). Both signed the petition for the separation of Brookline in 1704. Father and sons are frequently mentioned in the earliest town records,-the son Edward the more frequently, probably because of greater activity in current happenings. In addition to the real estate in Brookline which he inherited at the death of his father, the younger Edward owned lands in Roxbury, Dorchester and Needham, but he sold nearly all of it previous to his death in 1744. He was survived only by his widow, Mary, whom he married previous to 1719, and who, in the year following her widowhood, married Philip Gatcomb of Boston. Edward Devotion's last resting place is in the Walnut street Burying Ground, where the spot is marked by the old slate gravestone in that part of the grounds included in the half-acre originally purchased by the town in 1717. His will was signed and dated "this fourteenth day of June in the seventeenth year of his majesty's (George III) reign and in the year of our Lord Christ one thousand seven hundred and forty-three." By this will he names several legacies, providing particularly for his well-beloved wife Mary and for his beloved friend James Shed of Roxbury, both of whom were appointed executors. "Item. In case my estate prove to be sufficient to pay my just debts, funeral charges and the aforementioned legacies and there should be any overplus left, then my will is and I hereby give the said overplus to the town of Brookline towards building or maintaining a School as near the centre of the said town as shall be agreed upon by the town. But if the said Town cannot agree upon a place to set the said School upon, then my Will is that the said overplus be laid out in purchasing a Wood Lot for the use of the School and the ministry of said town forever." The question naturally arises, "Why did Edward Devotion make this provision in his will and why should he stipulate that his legacy should be for 'a school as near the centre of said town as shall be agreed upon by the town'?" The answer to the question may be found by a study of the town records from the beginning of the town to the year preceding the death of Edward Devotion. No more important subject engrossed the attention of the inhabitants than the education of their children and the providing of the necessary facilities in the way of schoolhouses. As early as 1728 the town voted to have one schoolhouse as near the centre of the town as a spot could be obtained. A committee was appointed to measure the town for that purpose, a survey was made and a plan drawn, of which a reproduction has been published. A piece of land was purchased for £20 from Peter Boylston, and a building "twenty-four feet in length, one and twenty foot in breadth and seven foot between joynts" was authorized. This building was not erected. The town voted to have a north school and a south school, and the Selectmen were instructed to dispose of the timber already prepared for the 24 ft. x 21 ft. building. "Voted, to choose a committee to find the most convenient spot to erect a school-house for the benefit of the whole town." During the period when this school question was discussed, Edward Devotion was serving the town in various public capacities, particularly as tythingman,-a position which means little or nothing to us in 1908, but a position which possessed important functions a century and a half ago. It seems fair to assume that the agitation of the school question, the knowledge of the needs of the community, the fact that he had no children to follow him, and a desire to benefit the town where he was born and where he had lived, caused him to make that provision in his will which has been quoted. When the provisions of his will became known, after Edward Devotion's death, the Selectmen of 1745-1746 took steps to protect the town's interest. In 1740 Edward Devotion had sold to Solomon Hill- a young man in whom he showed great interest-the seventy-six acres of land in Brookline which he had inherited from his father, -"it being the homestead of the said Devotion." He took from Solomon Hill and his wife Hannah (Sheldon) a mortgage on the property, and it was a condition affecting the legacy to the town that Hill should pay this mortgage before the legacy could be of benefit to the town, unless the executors should sell the estate by reason of the refusal of Hill to redeem the mortgage. Without going into legal technicalities or the details of real estate transactions, it is sufficient in this connection to say that Hill did not pay the mortgage, and under the authority of the will a committee, acting as the attorneys of the executrix, Mary Gatcomb, sold the property and distributed the proceeds as contemplated by the testator. The committee who acted in the town's behalf consisted of Mr. Isaac Gardner, Capt. Robt. Sharp, Mr. Thomas Aspinwall, Hon. Jeremy Gridley and Henry Sewall, Esq. These attorneys discharged themselves of their obligations by payments to Robert Sharp and the estate of Samuel White in the nature of reimbursements for sums which had been advanced to protect the town's interests; they also paid to Robert Sharp the sum of £15 4d lawful money for "purchasing a silver tankard for the Church of the town of Brookline according to the will of Edward Devotion." They also paid to the trustees named by the town to receive the same, the legacy, which amounted to three hundred and eight half Johannes, of full weight (equal to $3,696), "for ye use of a school in said town." "Voted, whether the town will appropriate the use of the Legacy left said town by Mr. Edward Devotion, dec'd To a school, and it passed to appropriate sd Legacy to the use of Keeping a School. Voted, That the Middle School House where it now Stands be the place to keep a School with the Interest of the Legacy left said town by Mr. Edward Devotion." The two volumes of accounts give the expenses of maintaining the schools, so far as paid from the income of the school fund, the principal items covering the salaries of the teachers and the cost of wood for the winter heating. 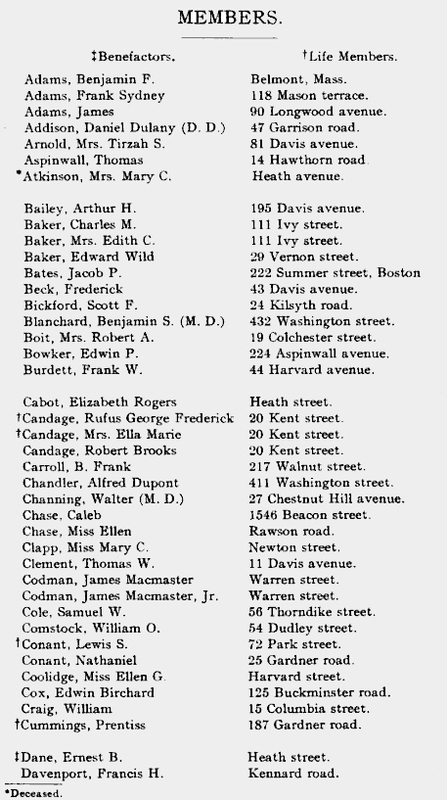 There are given the names of some forty schoolmasters who served during the life of the fund, about many of whom today there is no other record, but of those who were Brookline residents some have left a lasting impression on the town's history. Among such are Hull Sewall, 1762-65; Dr, Wm, Aspinwall, 1769; Stephen Sharp, 1775-77; John Goddard Jr. 1777; Isaac S. Gardner, 1808-09; and some others. In 1768 the master at the grammar school was Jonathan Searle, who must have been deep in learning and heavy in person if one may judge from the entry that 1s 4d was paid for bottoming the great chair. The principal of the fund was loaned on real estate mortgage security except in two instances. Loans were made to the Town of Brookline on several occasions, and to the "State of Massachusetts Bay" in 1777. The fund suffered nothing from the loans to the town, but the loan to the State depreciated seriously. In 1779, on account of the failure of paper money, the principal of the fund was reduced to the equivalent of $2,280.65, which was kept good until 1837; in which year the government of the United States made a distribution of the surplus revenue, and Brookline's portion, $2,209.34, was added to the school fund the interest to be applied to the support of the public schools. Two interesting entries are found in the earlier volume The first treasurer Isaac Gardner who served from 1762, lost his life April 19, 1775, when the British were retreating from Concord and Lexington. At the meeting of the School Committee "held at the house of Deacon Joseph White, September, 1775, John Goddard was chosen the School Treasurer in room of Isaac Gardner, Deceased." The committee held some of its meetings at the Old Punch Bowl tavern, as indicated by entries in 1772 and 1774 of small amounts paid Landlord Eleazer Baker for entertainment. "The Trustees of the School Fund avail themselves of this opportunity to Tender to the Town their resignations of said office, -this they do in consideration of their advanced ages, all of them having arrived over three score years and ten and some of them nearer fourscore. "They also embrace this as a suitable opportunity to report to the Town the present state of the School Funds, the amount of which ever since they have sustained the office of Trustees till within the last year has been $2,281.08, on which no diminution has occurred. "During the past year there has been added by vote of the town two installments of this Town's proportion of the surplus revenue of the United States, . . . making the total amount of said fund $4,501.74, all of which is now on loan secured on mortgages of real estate. . . .
"We have strictly attended to the Votes of the town from time to time, by confirming the loans on Notes accompanied with mortgages on Real Estates and we have no doubt of the ample sufficiency of the above securities." The report of the committee was accepted with thanks for long and faithful service; but, alas! 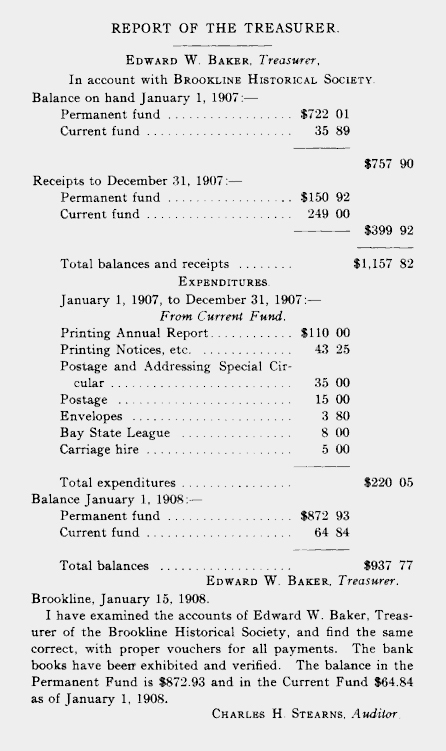 the school funds, as such, remained on the town records only a few years longer. In the summer of the year 1843, two events occurred which had considerable effect on the later disposition of the school fund. The town appropriated a part of the old town hall building (now Pierce Hall) for a High School, and the engine house was burned. These two events precipitated the question of a new town hall building, which was referred to a committee of five. 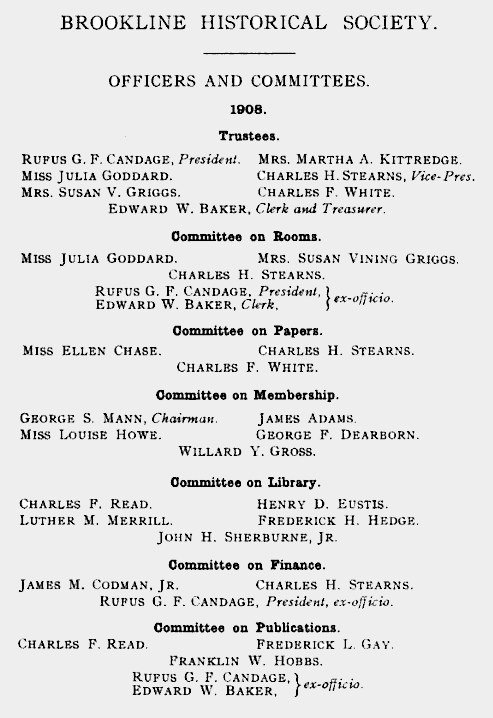 On this committee were appointed Abijah W. Goddard, Charles Stearns, Jr., and Daniel Sanderson, who were also trustees of the school funds. "'Tho' not so central as the other lot suggested [it] is considered by your committee an eligible and beautiful situation- combining the advantages of an eligible place for a fire engine house and two spacious school rooms which may be made in the basement at small additional expense, sufficient accommodations for 144 scholars; allowing two ample rooms for the fire engine and allowing the sale of the old school house and lot on School street." The committee further recommended that the surplus revenue received from the federal government be taken from the school fund and used towards the expense of building the proposed combination town hall, engine house and schoolhouse, and that the town borrow the balance. When today we see the crowds of school children attending the primary and grammar schools on the enlarged lot on School street we must conclude that the town meeting of that day did not look far into the future when the committee's report was accepted and adopted, with an appropriation of the surplus revenue and $4,000 additional. Having taken the step of appropriating part of the school fund for other purposes it became easy to use it all, losing sight of the terms of the bequest by Edward Devotion. At the town meeting in April, 1844, the trustees of the school fund reported that, upon further consideration of the action by the town in appropriating for the Town Hall building the surplus revenue portion of the school fund, which amounted to about half of the whole fund, they had concluded that it would be for the interest of the town to use the remainder of the fund for the same purpose; that in order to avoid any danger of reversion the town might become the borrowers and be responsible to the trustees, as individuals would be, by which course the security of the fund would be beyond question, and the trustees would be relieved of a great share of the perplexing duty incumbent upon them, etc. This report was accepted and adopted. The town reconsidered the matter of the plans for the town hall, as a result of which the engine house was erected as a separate building and the School street lot was not sold, but did make use of the whole of the school fund, amounting to $4,789.26, towards the cost of the building. "The Trustees, agreeably to their instructions, having collected the funds, by transfers of the securities or otherwise, and the same having been invested for the promotion of education, in the erection of a Town Hall in which some excellent school rooms have been provided, behaving that the objects for which a part of the fund was originally given are as fully attained as they would have been under any other circumstances, would now most respectfully ask to be discharged. The rooms in the town hall became badly overcrowded in a few years, as well as the schoolhouse on the School street lot, and the solution of the problem was the building of the Pierce Grammar School on Prospect street in 1855. The rooms formerly used for schoolrooms were taken for town offices, and in 1857 the hall on the first floor was taken for the accommodation of the Public Library. After 1840 the school fund disappeared; the accounts in succeeding years do not refer to it in any way as in the nature of a loan to the town, and both donor and fund appeared to be forgotten. In 1857, when the Public Library was established, an attempt was made to "call in" the school fund for the purpose of a library and evening school, but without success. For another score of years nothing was heard of the Devotion School Fund, until 1877, when a committee, to whom was referred the matter of trust funds, made a report and recommended that the legacy should be made good by the town. This committee suggested that a note for $2,280.65, the amount of the principal of the fund from 1818 to 1838, should be authorized by the treasurer, on which note the town should pay five per cent annually, to be raised by taxation, the amount to be part of the sum appropriated for school expenses. This suggestion was referred to a committee on school accommodations, which committee never reported. "The gift of Edward Devotion was a trust which the town, having accepted, ought to carry out in accordance with the wishes of the donor. At the time this was bestowed, it met a very considerable portion of the expenses of our public schools, and was comparatively of far greater value than a gift of the same amount would now possess. For nearly a century the trust was executed, and we are now in a better position to place ourselves right in the matter than we have been for many years. Some action in the direction recommended by the special committee on trust funds in 1877 should be taken. "The donor contemplated associating his gift with a school at the centre of the town as general in its benefits as practicable. The High School has this characteristic more fully than any other, and is much in need of a new building. If the interest on the Devotion Fund from the time of its diversion were added to the principal, and the fund then suffered to accumulate until it should be sufficient to erect a suitable High School building, designated in some way to perpetuate the memory of this gift, and the town's recognition of the purpose to which it was applied, it would seem to be as fitting action as is now practicable." "That the bequest of Edward Devotion 'towards building and maintaining a school as near the centre of the town as shall be agreed upon by the town' having been invested in the High School building, the large hall in the same shall hereafter be called the 'Edward Devotion Hall' in his honor." In the next report of the School Committee this statement appears: "A handsome but not expensive tablet, commemorating the gift of Edward Devotion to the town, has been placed on the wall in the main hall" [of the High School]. When the old High School was succeeded not many years later by the present building, and the present magnificent Pierce Grammar School was erected on the old High School site, can anybody tell what became of that "handsome but not expensive tablet" to the memory of Edward Devotion? The writer has asked every one who ought to know, but as yet has not succeeded in ascertaining what disposition was made of it. The rapid increase in population in the north part of the town after Beacon street boulevard was built, beginning in 1887, made imperative the necessity for school accommodations in that district. In 1891, at a cost of over sixty thousand dollars, the town purchased what was called "the Nahum Smith estate." This was a part of what older residents knew as the Babcock Farm, and was a part of the seventy-six acres originally belonging to the Edward Devotion homestead, which he inherited from his father and sold, in 1740, to Solomon Hill, as has been told. On the property purchased stood the old house, built in 1680, and which had been occupied continuously, or practically so, from the time it was built until purchased by the town. The next year (1892) the present primary school building was erected, followed a few years later by the companion grammar school building, with the old house standing between the two. The School Committee named the buildings the "Edward Devotion Schools," and in their report for 1892 outlined a plan for a comprehensive and elaborate development of the area by a group of buildings which when completed will be a fitting memorial for any benefactor of the town's educational needs. The saying is old but true that "we cannot have our cake and eat it, too." The Devotion legacy was honestly and intelligently invested, and the income used for maintaining the schools as intended by the giver of the fund from 1762 to 1837. It was not the fault of the trustees that the war which our country fought for its independence brought a depreciation in values, and reduced the income from investments. No one can blame them for loans to the state in the times of need and stress. There was no "graft," and, as the committee of 1837 reported, there was "ample sufficiency of the security." It would seem, however, that when the town, in 1846, took the school funds to build the town hall it was false to the trust. To be sure, in 1883, the attempt was made to clear the record by calling the High School enlargement an investment of the Edward Devotion fund. But that improvement was imperative, and the money used was Devotion Fund money only by the flimsiest of apologies, and even then the apology was soon lost sight of, and the memorial tablet disappeared from view. When the School Committee named the Harvard street buildings the "Edward Devotion Schools," there was at last some fitting memorial to the name of that one of the twenty eight signers of the Muddy River petition for independence who thought so much of the home of his parents, who felt so great an interest in the place of his own birth and residence for seventy-six years, that he bequeathed for the educational and religious welfare of the community a goodly share of his earthly possessions. Let us hope that never again will the town forget Edward Devotion and what he did for the town's benefit. THE WOODWARD-GOLDSMITH HOUSE, CLYDE STREET, BROOKLINE. Written by Miss Ellen Chase and Charles F. White. Read before the Society by Charles F. White, February 27, 1907. The old house which is the subject of this paper stood facing the southwest on a little knoll about fifty feet east of Clyde street and seven hundred feet south of the junction with Warren street. It has been called the Woodward House, although it is not known just when it was built, nor by whom. Woodwards were in Brookline very early in its history. In 1637 a grant of twenty-eight acres, bordering the "cedar swamp" on the southwest, was made to Nathaniel Woodward the elder, who is shown by the Book of Possessions to have owned a lot occupying the present northeast corner of Washington and Summer streets in Boston, where his residence probably was. At the same time Nathaniel Woodward had a house and garden on the northerly side of Fort Hill near the cove, and he was no doubt a son of Nathaniel the elder, so called to distinguish them. In 1637, also, a vote was passed in Boston agreeing that John and Robert Woodward, sons of our brother Nathaniel, should have house lots allotted to them. Further, the book of possessions shows by an entry in 1639 that "also a great lot be granted to our brother Nathaniel Woodward at Muddy River for three heads." (It is interesting to note in passing that Mr. Theron Royal Woodward of Chicago, who at the time of his death last year was engaged upon a genealogy of the Woodwards, was a descendant of Nathaniel the elder and his son Nathaniel just referred to.) This particular line of Woodwards is not the one, however, that is associated with the old Clyde street homestead. How they were connected, if at all, we do not now know, though it is natural to think that they were. A dozen years after the grant of the great lot to Nathaniel, that is, in 1651, Thomas Woodward of Boston grants to Alexander Beck of Boston four and a quarter acres of land at Muddy River, bounded in part by land of Nathaniel Woodward, the deed being sealed and delivered in presence of John Angier and William Aspinwall; showing that Nathaniel and Thomas had been adjoining land owners in Muddy River. In 1652 Thomas Woodward bought of Zaccheus Bosworth a lot of land occupying the southerly corner of Milk and Washington streets in Boston. It seems probable that the Woodwards of our present interest are descendants of this Thomas. In examining the records of the first century of settlement we must bear in mind that up to 1705 Muddy River was part of Boston, consequently births, marriages and deaths were of record there. During the same period, and indeed until 1717, Muddy River inhabitants were parishioners of the Roxbury church, and baptisms and other church records will be found there. 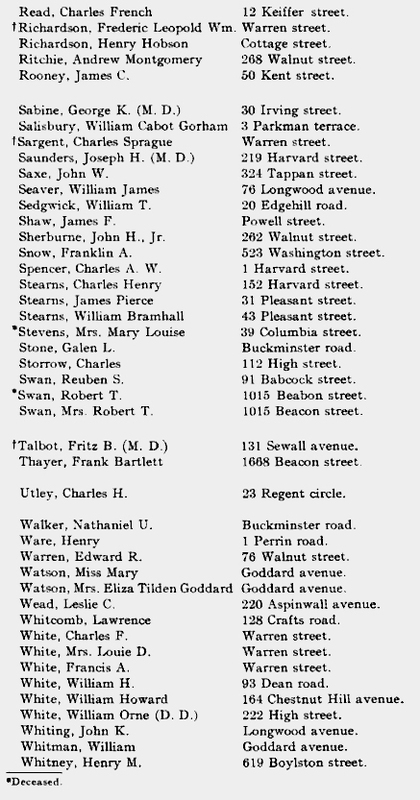 So intimate were the associations of Brookline and Roxbury, however, that entries properly belonging in Boston were made in the Roxbury town books; such an instance is the entry,-"14 January, 1659-60; born, Thomas Woodward, son of Thomas." Boston birth records next show, 1663, Esther, daughter of Thomas and Esther Woodward of Muddy River. Next Roxbury church records show that Thomas Woodward joined the church there April 24, 1664. The next Sunday, i. e., May first, Thomas and Esther, children of Thomas Woodward, were baptized. It is one of the pictures of life-this joining by the father and his bringing his two children the next week. It clothes with flesh and blood the dry entries two and a half centuries old. We get a further touch of life concerning the mother of these children when we read,-"8 June, 1673, Esther, wife of Thomas Woodward, entered full communion." The next Boston entry is the birth on June 24, 1667, of Elizabeth, daughter of Thomas and Judith. (I think the entry of Judith as the mother's name is due to confusing the names of two Hebrew heroines.) Then, from Roxbury, "30 July, 1667, baptized Elizabeth Woodward, daughter of Thomas"; on the 13th of January, 1668, the birth of Mary, daughter of Thomas and Esther, and her baptism, at Roxbury, on the 17th of January of the same year; in 1670, the birth of Rachel, daughter of Thomas and Esther, and the baptism at Roxbury, November 27, 1670, of Rachel, daughter of Thomas. Next, the Boston record enters the birth of --,son of Thomas and Esther, Sept. 10, 1673, and the Roxbury church records give on October 19, 1673, the baptism of Robert, son of Thomas Woodward. The last Roxbury entry is the baptism, March 25, 1675, of Mehitable Woodward, daughter of Thomas, her name being omitted from the Boston records. We get another glimpse of this family from the Roxbury church records, learning that in 1681, "23d January, Thomas Woodward Jr., Esther Woodward and Hannah Woodward with Sarah Devotion, all these take hold on the covenant." Thomas Woodward was then twenty-one years of age, and Esther seventeen; Hannah, I cannot identify- But in 1685, when also seventeen, Mary Woodward signed the covenant. It is something noticeable that during this period of twenty five years, from 1660 to 1685, we do not find that Thomas Woodward held any offices in Brookline; for in those early days of scanty population almost every man was called upon to serve, and punished by fine if he did not. Perhaps some physical disability excused him. That he was here, nevertheless, is shown by the birth entry of Esther, 1663, given above, and by a tax list for 1674 printed in the Record Commissioner's reports, wherein Thomas Woodward of Muddy River is taxed three shillings for his "county rate" and the same amount for his "poor rate." The Roxbury church records enter his death Sept. 10, 1685, while the Roxbury town record gives the additional detail of "Thomas Woodward, Senior." We get our last glance at the first generation in the tax list of 1693, which contains the name "Widow Woodward." We do not know precisely where in Brookline Thomas1 senior lived; only that in 1651 he sold some land near the "cedar swamp," or in what is now Longwood. Thomas2 junior we can locate with more certainty and identify him as an owner of the property on Clyde street, by the succession of the deeds. The items on record regarding him after his joining the Roxbury church are as follows: In 1687 he is on the tax list for Muddy River as owning 6 acres of land, 2 cows, 1 heifer, 1 horse, 12 sheep and two buildings, and his total tax, including two polls (probably himself and hired man), was 5 shillings 4 pence; in 1691 and 93 his name appears on poll lists. In 1694 his name first occurs in the town records, when he is chosen fence viewer. He held the usual round of local offices, serving most as tythingman, at intervals from 1707 to 1729. He seems to have been firmly set against serving as constable, being several times fined for refusing to serve, one of the fines being recorded as £4 4s. The record of his first election, made by Samuel Sewal, Jr., town clerk, is brief enough:- "Chose Thomas Woodward constable, Dropt him." The office of constable seems to have been generally unpopular from the chief duty connected with it, that of collecting the taxes. No doubt the people looked upon the constable much as the people of Thrums did upon Wearyworld, whom they elected policeman. This is the Thomas Woodward whose name is in the list of petitioners for the incorporation of the town in 1705. I have found no record of Thomas2 - Woodward's marriage. His wife's name was Tryphena. Roxbury church records of baptisms as printed omit 1688 to 1750, but Boston and Brookline birth records supply data regarding the children of Thomas2 and Tryphena, as follows:-"16 May, 1690, Mary; 26 Sept., 1692, Thomas3; 30 Jan., 1694. Tryphena; 11 Sept., 1697, John; 9 Nov., 1699, Hannah; , Sarah; , Elizabeth; 18 June, 1709, Joseph." Of these children, Sarah and Joseph died before 1729, while Elizabeth seems not to have been party to the division of the estate. 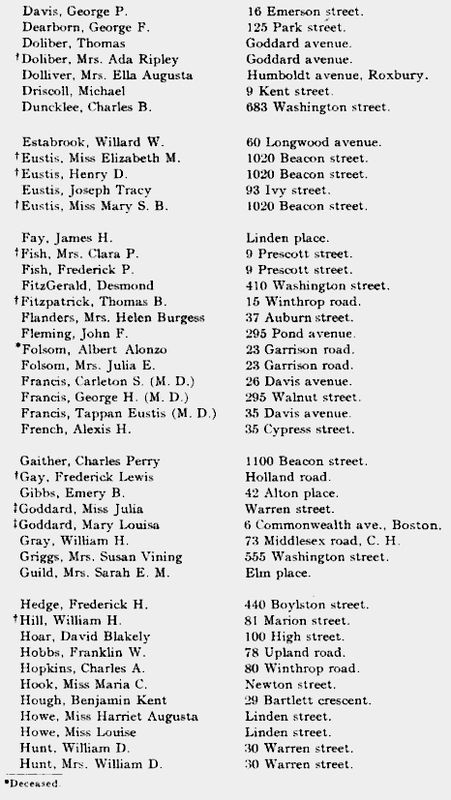 Unfortunately Boston no longer kept our records, and Brookline death records do not begin until 1761. We cannot be exact as to when Thomas2 Woodward possessed the Clyde street property, but in 1699 he buys two parcels of land, one from Uriah Clark and a second from Joseph2 White. These were recorded in Suffolk deeds. Vol. 19, pp. 306-9, but some vandal has cut from that book pages 283 to 340 and the descriptions are thus lost. This Joseph2 White, second son of John1 senior, was grandfather to Deacon Joseph White, who later bought the house on Clyde street from Thomas4 Woodward's grandson Thomas4. In April, 1702, Joseph Buckminster of Muddy River, tanner, and Martha, his wife, deed to Thomas Woodward of Muddy River, yeoman, twenty-two acres of land at Muddy River, bounded northerly by Josiah Winchester, easterly by Dorman Marean and Joshua Child, southerly by Thomas Woodward, and westerly by Jonathan Torrey-names associated with the southerly side of Brookline, between the present Clyde and Newton streets. It now becomes of interest to notice the origin of Clyde street, where this old homestead was located. At the March meeting of 1714 it was voted, "That the southwesterly end of the Town have a way laid out for them by the said Town." At the November town meeting of 1715 town clerk John Seaver records- "Voted, That there should be an open way laid out from the south part of Brookline, to wit, from the road that leadeth from Jamaica to Erossamond Drew's sawmill along by Joshua Child's house to the Country Road that leadeth from Roxbury to Newton through Brookline along by Leftenant Thomas Gardner's house." In October, 1717, the town voted, "That the New Way laid out between Isaac Child's and Thomas Woodward's be repaired and made feizable at the Town's cost." We notice the change from Joshua Child to Isaac Child in these votes, two years apart. Isaac in 1717 was twenty-nine years of age, a son of Joshua. He had shortly before married Elizabeth Weld, and had no doubt established himself on land formerly his father's, and his house was located either where the "Hyde" house is now, on Newton street, or perhaps on the northerly side of the street upon the land of the late Mr. Willard Humphrey. An entry printed on page 110 of Brookline Records recites the vote of 1715, and proceeds, "which accordingly was effected by the selectmen, viz., Capt. Samuel Aspinwall, Thomas Stedman and John Winchester, Jr., who have agreed with all the proprietors, and the Damage by running said way through their properties has been paid as appears in the Account Book of said Town of Brooklyn. The aforesaid Highway beginning as aforesaid near Isaac Child's house on the east of said house as it is staked out and running northerly through Isaac Child's land to the land of Samuel Newel and then turning a little, toward the east, running through the land of Joseph Dudley Esq'r then turning northerly and running through or upon part of Joshua Child's land, being part of Bowen's Farm so called, then entering upon the Land of Thomas Woodward to the Land of Joseph White, then turning a little toward the East, running to the land of the Heirs of Jonathan Torrey, Late of Brooklyn, alias Mudeyriver, Deceased. Then running Northerly to the Road or lane known by the name of Woodward's lane to the Road commonly known by the name of Sherbourn Road." Twenty-seven years have passed since Thomas- Woodward made his earlier purchases of land. The sons are grown when we find (Suffolk Deeds, 56-156) that "11 Feb., 1726 Thos. & Tryphena Woodward convey a parcel of orchard and meadow land to their son John." Thomas2 Woodward, Sr., died about 1731, having made his sons Thomas2 and John' executors of his will, with power to decide whether the portions of the four sisters should be paid in money or lands. They elected to divide the lands, as is shown by an indenture entered on April 26, 1731 (Suffolk Deeds. Vol. 56. p. 176). The real estate included the homestead of eleven acres and four other lots-the aggregate being forty-nine and one-half acres. One-half the mansion house, barns and out-buildings, with all moveables, and one-half the use of the lands were given the widow during widowhood, and to the three unmarried daughters the use of the best chamber, if agreeable. All the children were to share and share alike in the real estate, save that Thomas3, the eldest son, was to have a double portion as the Province Law directed. Six years were allowed for the settlement, and in April, 1738, the papers were signed and acknowledged before Samuel3 White, Justice of the Peace. We may note in passing that Mary Woodward married James Goddard in 1713; Tryphena married William Dyer in 1741; and Hannah died in Brookline, unmarried, in 1764. Thomas3 died in Brookline, probably unmarried, in 1768; John3 Woodward (Brookline Town Records, Vol. 3, p. 208; Vol. 4, p. 28) married Nov. 30, 1722, Mary Goldsmith of Wenham. They had children-Joseph, born Dec. 9, 1723, died Nov. 19, 1796; John, born Feb. 23, 1725; Thomas, born April 12, 1730. John3 held a number of offices in Brookline and died Feb. 15, 1770. His widow Mary died in April, 1779, aged 87 years. She was the giver, in 1770, of two cups for the communion service of the First Parish church. They are still preserved. As has so often been the case, the homestead passed to the youngest of the three sons of John3. I have not found record of the marriage of Thomas4 Woodward, but his wife's name was Mehitable, as appears from town records, deeds, etc. Their children were: Mehetable, born March 11, 1757; Sarah, baptized Aug. 27, 1758; , born April 23, 1760, died next day; Thomas, born June 5, 1762; Benjamin, born March 11, 1764; John Goldsmith, born Dec. 0, 1766; Elizabeth, born Feb. 15, 1769. Of the father, Thomas4, it may also be said that he served the town in a number of capacities, as the records set forth. 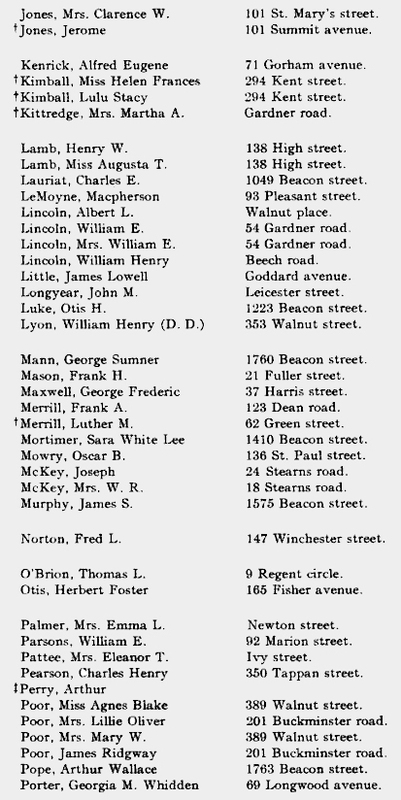 At some date near 1770 the Woodward homestead passed from their possession by deed to Deacon Joseph4 White of Brookline, and appears to have been bought for the use of his son Daniel5, since in 1771 Daniel White's name replaces that of Thomas4 Woodward in the regular sequence of the Brookline tax and valuation lists. These manuscript lists in the town clerk's office, covering a number of years, are full of interest. For many years they uniformly began with the Griggs farm near Allston, and followed the line of Harvard street, side-stepping a little to take in the few who lived on upper Washington or on School street. Passing down to the "Punch Bowl" the list followed out the Sherborn road, i. e., Walnut street, and so along the side of Fisher's Hill to Heath street, with another offset to take in Col. Isaac Gardner's on Brighton street; thence up Heath street to the Newton line, whence a jump through the woods reached Drew's sawmill; from there down Newton street through Clyde to Warren, and so to the meeting house, thus completing the circuit of the town so far as habitations were concerned. This is not the time to enter into much detail as to the Whites, who owned the house for some sixteen years. Deacon Joseph4 White, born 1702, died 1777, was the eldest child of Deacon Benjamin3 White and his wife, Margaret Weld. He lived just west of the present junction of Heath street with Penniman's Lane. He served the town in various capacities for fifty-three years and was deacon for twenty-one years. His estate comprised one hundred and seventy-one acres in Brookline, with seventy-six acres in Newton, as well as land in Needham. His wife was Sarah, daughter of Ebenezer Crafts of Roxbury, and all of their eight children lived to mature age. Two of his sons served in the early days of the Revolutionary War, Daniel5 being second lieutenant in Captain Thomas5 White's company, which marched on the Lexington alarm. 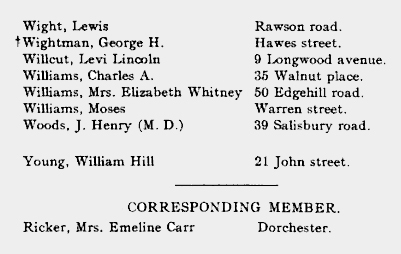 The descendants of Deacon Joseph White are still numerous in this part of Massachusetts. Lieut. Daniel5 White was born in 1739 and in 1772 married Mary, daughter of Isaac Child, Jr., and Elizabeth Weld, and granddaughter of Isaac Child, Sr., and his wife Elizabeth Weld, he whose house was near the southerly end of Clyde street. The children were: Bartholomew6, born 1773, married in 1798 Hannah, daughter of Aaron and Hannah (Richards) Davis of West Roxbury. He lived many years in the old-fashioned house that is on the northeast corner of Weld and Corey streets. He died in 1855 and was buried in the old burying ground near Lagrange street on Center street, West Roxbury. Anna, born Oct., 1775, and Hervey, born May, 1781, were the only other children, and I have been unable to learn anything of their story further than that they lived to maturity at least. Daniel5 White served the town from 1772, when he was chosen Surveyor of Highways, until 1785, when his last service was upon a committee, with Jonathan Dana and Benjamin5 White, to consider and report on the matter of "selling spaces or spots on which to build pews in the meeting- house." That Daniel5 White ceased to live in the Clyde street house about 1780 is proved by an old contract of lease entered into that year between him and his elder brother Samuel5. This lease, found among some old papers by Dr. Walter Channing, has come into the possession of the Historical Society. The tax lists also indicate his removal to his father's homestead by the change in location of his name therein. Daniel5 White died about 1813 or 1814, and Mary his wife in 1829. By deed of April 2, 1785, Daniel and Mary White sold the property to John Corey. The earliest entry of John Corey's name in Brookline town records is for 1787, when he and Benjamin5 Davis, grandson of Deacon Ebenezer3 Davis, are elected hogreaves. He served in other capacities until 1703, when by a curious coincidence his last recorded service is again with Benjamin Davis, this time as highway surveyor. In what way, if any, John Corey was connected with the Coreys of Washington street, I have not ascertained, but it is suggestive that in 1807 Timothy and Elijah Corey are guardians for his minor children, after his death Oct. 6, 1803. He was born in 1759 or 1760, and married in Brookline Nov. 26, 1788, Elizabeth Corey. She died here Sept. 25, 1845. Their children were: Elizabeth, born 1789; Harriet, 1792; Anna, 1796; and Caroline, 1802. The next transfer of the land is in 1819, when John M. Upham of Newton, in right of Anna, his wife, and Elizabeth Corey of Newton, spinster, for $1466.67 sell to Erastus Champney, housewright, two-thirds of a tract of fifteen acres of land with house and barn, in common with the undivided third owned by Caroline Corey, a minor. Harriet Corey, the fourth sister, had died in 1813. Champney at the same time mortgages the estate to John M. Upham, et al. Erastus Champney was a native of Keene, N. H. His first wife was Sarah Sumner Winchester, daughter of Nathaniel Winchester and Sarah Davis. They were married by Dr. John Pierce Feb. 24, 1807, and their five children as shown by the church records were Nathaniel Winchester, baptized Jan. 1, 1809, died March 5, 1809; Erastus, baptized April 13, 1810, died April 21, 1810; Joseph Addison, baptized Aug. 4, 1811, died Oct. 21, 1811; Erastus, baptized Sept. 6, 1812; Sarah Ann, baptized Dec. 29, 1816, died Oct. 4, 1817. The wife Sarah died in 1817, and he married second, March 15, 1819, Hannah Homer Hunting of Brookline. He married third. May 1, 1823, Abigail Prentiss of Roxbury. Erastus Champney was chosen tythingman in company with Robert Sharp Davis, Sr., in 1812, and was hogreave in 1820 and 1824. In 1825 John M. Upham of Newton, yeoman, with Benjamin Richardson and Elizabeth (Corey) his wife, sells the estate described in the mortgage from Champney to Upham, et al., to hold subject to redemption, to Elisha Wheeler. The same day Caroline Corey of Roxbury, spinster, sells to Elisha Wheeler her undivided third of the estate descended from her father, John Corey. Erastus Champney, cabinet maker, also conveys at the same time to Elisha Wheeler his interest in two-thirds of the estate. Two days later, i. e., Oct. 24, 1825, Elisha Wheeler of Boston, trader, and Betsey his wife convey to Sarah Dunn of Brookline fifteen acres, formerly part of the farm of John Corey, descended to his three children, Elizabeth, Anna and Caroline. In April, 1830, John Dunn of Providence and Sarah his wife sell to John Kettle, merchant, the estate conveyed to Sarah Dunn by Elisha Wheeler. On May 14, 1830, John Kettle of Boston, merchant, quitclaims to Luke Baldwin of Roxbury, merchant, the estate for which he recovered judgment at Dedham in 1832 on foreclosure of a mortgage. On May 18, 1830, Luke Baldwin conveys the property to John Hunt of Boston, housewright, being the buildings and fifteen acres of land conveyed to him by John and Susan Kettle. In 1837 John and Sarah Hunt convey to George W. Goldsmith of Roxbury the estate conveyed to Hunt by Luke Baldwin. In his possession it remained forty-five years, to the time of his death, and in possession of his heirs for some twenty years more. George Washington Goldsmith was born in Andover, March 29, 1808, son of John and Mary Goldsmith. He died Dec. 14, 1882, aged 74. He married first, at Roxbury, Dec. 23, 1832, Lucinda Hutchins, born June 17, 1806, at Bristol, Maine. She died Aug. 16, 1838, leaving one daughter, Emily Ann, born Sept. 16, 1837, died about Jan. 10, 1865. Mr. Goldsmith married second, Aug. 18, 1839, Ruth Hutchins, also of Bristol, Maine, and, I infer, sister of his first wife. She was born July 17, 1808. Their children were: George, born March 5, 1840; Abby Jane, born Dec. 9, 1841, married Sept. 27, 1863, Levi Hastings of Ashburnham, son of Joseph B. and Adeline Hastings; Ellen, born Nov. 18, 1843, married Sept. 30, 1865, Edgar N., son of Seaman and Mary Lull, born West Stafford (or Stafford), Conn., a lawyer, resided in Tolland, Conn.; (male infant), born Feb. 13, 1846, died at once; Ruth, born March 23, 1848. Mr. Goldsmith appears to have married a fourth time, as the town records give the birth in 1853 of his daughter Clara, with the note "dau. of Anna of England." Clara Goldsmith married Mr. George H. Cowan, the next neighbor to the north on Clyde street. The youngest child, Henry W. Goldsmith, now lives at Danvers. In 1903 by settlement of the estate of George W. Goldsmith the title passed to his son-in-law, Mr. Hastings, and from him to the present owner, under whom the ancient house was torn down and the land divided for sale. The demolition of this house gave opportunity to note in detail the framing and construction, and to measure and photograph these points. It was of massive hewn-oak timber, with a great central chimney. The body of the house measured outside 36 feet by 18 feet, with the old-fashioned lean-to on the rear, giving the picturesque long slope to the roof at the back. The framed walls were interlined with brick laid in yellow clay, which was also used to lay the bricks of the chimney below the roof. The small amount of cross partition, which with the huge chimney divided the rooms, was made of paneled work of white pine. The long kitchen in the lean-to had a large fireplace and brick oven, while each of the four principal rooms had a fireplace. Portions of the frame and panel work were removed to Aspinwall hill and incorporated in a manner to be readily seen in a building there. Thus passed one of the last, but not the very last, of the Brookline homesteads which had seen almost two centuries of the town's life.